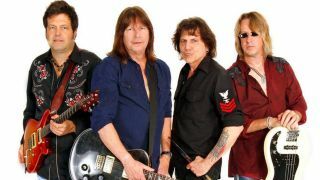 Canadian guitar icon Pat Travers says he’s stripped back his sound on his upcoming album Retro Rocket. It’s set for launch on March 17 via Cleopatra and he reveals he took the decision as he wanted to capture the sound of the 70s. He tells Classic Rock Revisited: “With Retro Rocket all I really did was just strip everything down. I had a ’57 Gold Top Les Paul and no effects, and I just played it all one time through. I did a couple of overdubs, but nothing major. I just tried to get that raw kind of feel that bands were doing in the 70s because they had to – there was no other way to record then. Along with Retro Rocket, Travers has just released Live At The Iridium. It was recorded in New York in 2012 and he says it was his first comfortable performance in the city after many disappointing shows. He’ll return to New York in April as part of a run of four US shows with his band: drummer Sandy Gennaro, guitarist Kirk McKim and bassist Rodney O’Quinn.